Airy pulses are self-accelerating optical wavepackets featured by a quasi-nondispersive intense peak . In linear optics, they are the key ingredients for the realization of optical bullets, while in a nonlinear environment, they tend to shed off-shooting solitons under the effect of a Kerr nonlinearity or can be exploited to control super-continuum generation in highly nonlinear fibers. Such Airy pulses are analogous to spatial Airy beams which have been studied extensively due to their intriguing phenomena and potential applications. oooooooooooooooooooooFig. 1. Instantaneous frequency for the main lobe varies during linear propagation. Fig. 2. Experimental setup. EDFA: erbium-doped fiber amplifier; OSA: optical spectrum analyzer. The plot in the pulse shaper schematically shows the cubic phase structure wrapped between -π and π where the circle indicates its center. One of the several properties of Airy beams is theappearance of a spectral defect in the spatial spectrum that shifts along the propagation in a nonlinear medium . We expect the temporal counterpart of this effect to be a spectral feature that varies along the propagation length (schematically shown in Fig. 1). In our project, we study the self-phase modulation (SPM) of Airy pulses under the effect of both anomalous (LEAF) and normal dispersion (DSF) in fibers. 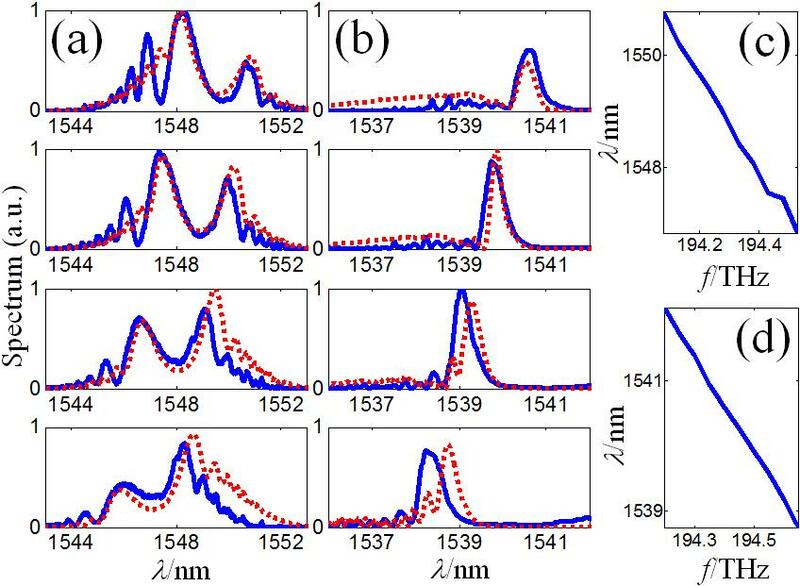 These self-accelerating pulses are generated through the modulation of Gaussian pulses via the cubic spectral phase structures produced in a pulse shaper (see Fig. 2). During nonlinear evolution, most spectral components of the Airy pulses concentrate into one or two peaks for normal and anomalous dispersion, respectively. The resulting peaks self-shift along the propagation, effectively mapping the longitudinal coordinate into the frequency domain. The frequency shift can be precisely controlled by simply acting on the spectral cubic phase structure, without the need to alter the fiber length . Fig. 3. Experimental results (blue solid line) and theoretical prediction (red dashed line) of frequency shift control in (a) LEAFs and (b) DSFs. (c) and (d) plot the positions of the spectral notch and peak relative to the center of the cubic phase structure, corresponding to (a) and (b), respectively.